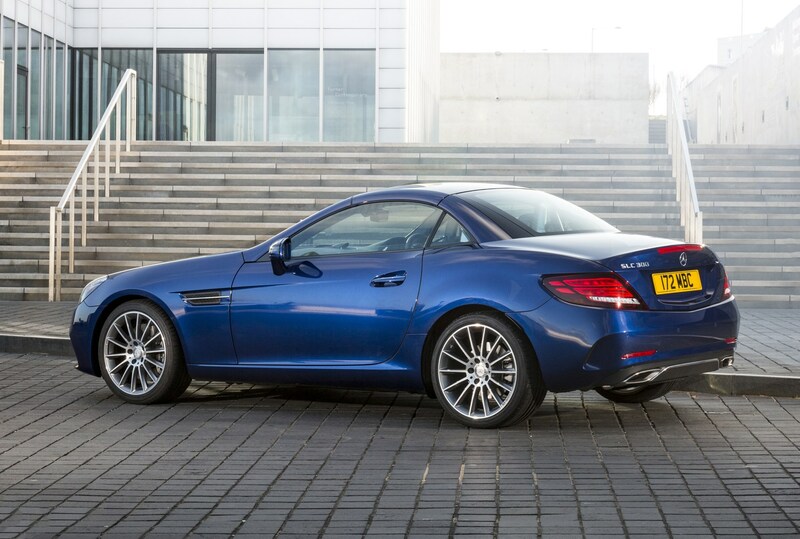 Nice and simple here with two model lines - Sport and AMG Line – depending on what sort of look you want for your SLC, including different alloy wheels and upholstery. 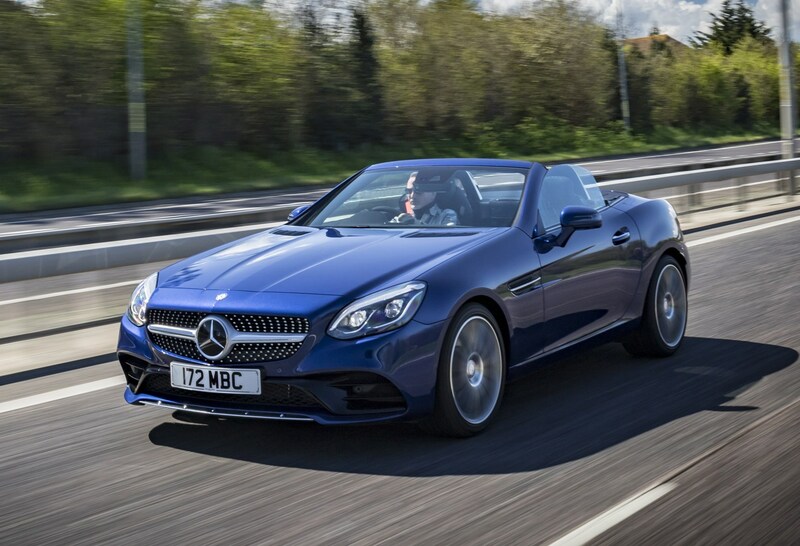 You get a fair amount of kit as standard, including halogen headlights with integrated LED daytime running lights, sports pedals, LED tail lights, chrome-plated twin-exhaust system, remote boot-lid release and Headlamp Assist. 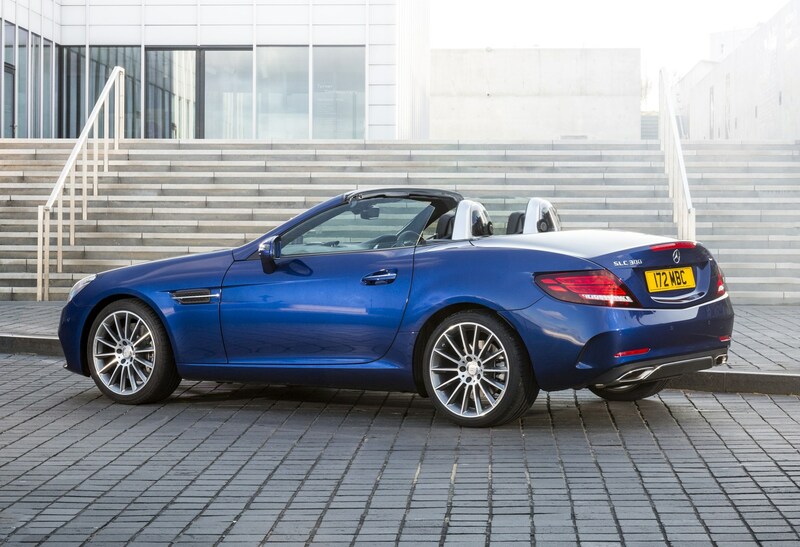 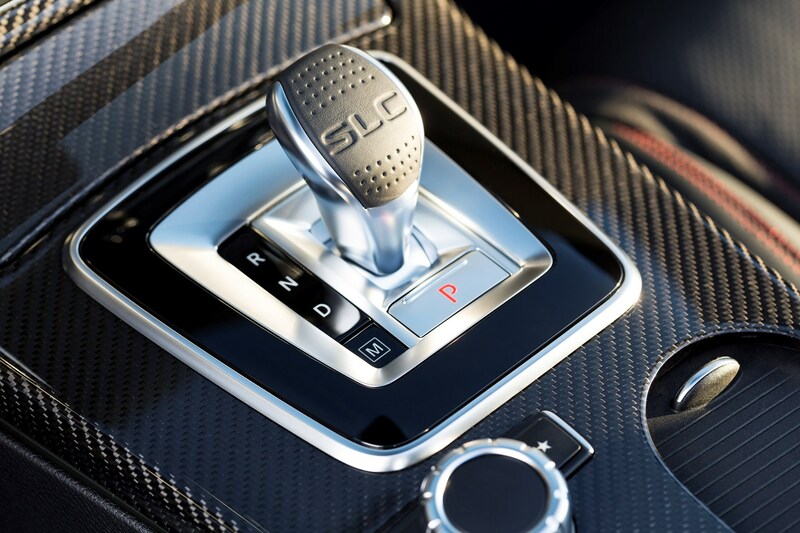 A new sports exhaust system is standard with automatic cars, so you’ll only miss out on it if you pick the manual SLC 200. 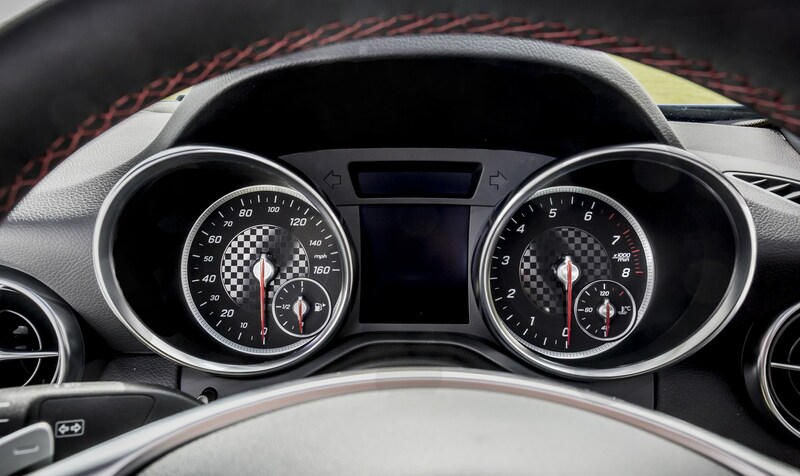 Inside there’s a fake carbon fibre-look trim and refreshed instrument cluster including a seven-inch display (increased from 5.8-inch) plus the folding metal roof can be operated up to 30mph. 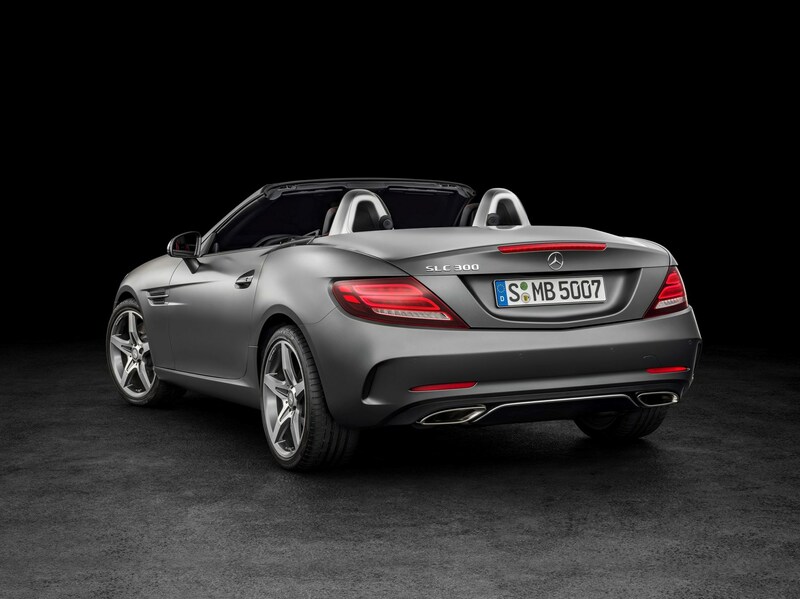 Sport models come with 17-inch five-spoke alloy wheels and a new multifunction sports steering wheel finished in Nappa leather. 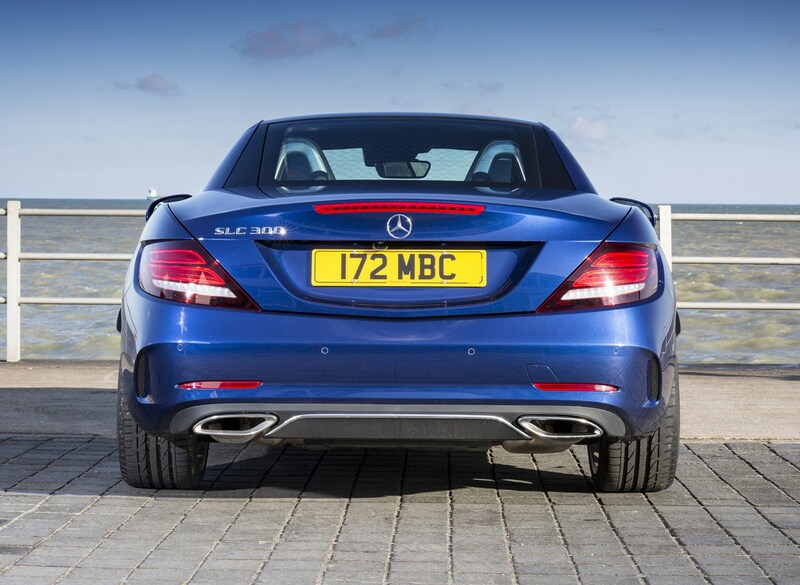 AMG Line cars have 18-inch multi-spoke alloys. 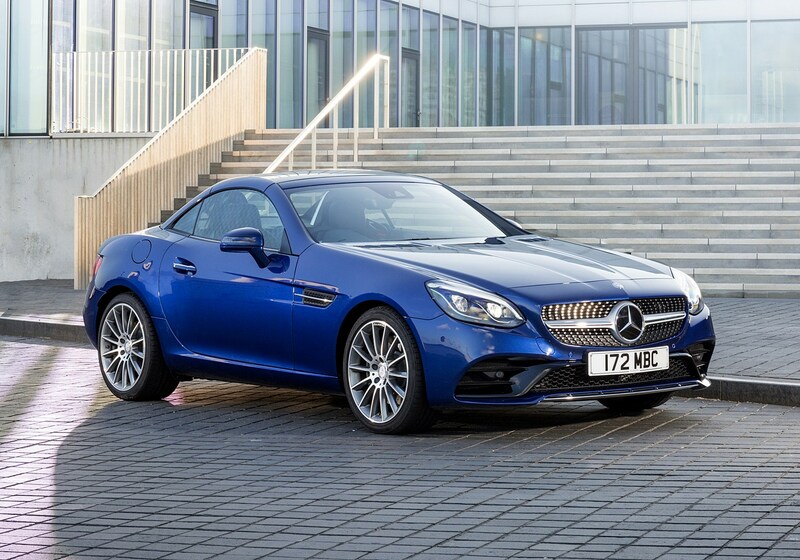 Plenty to customise your SLC with here, including intelligent LED headlights, and the Keyless Go package featuring an automatic boot separator. 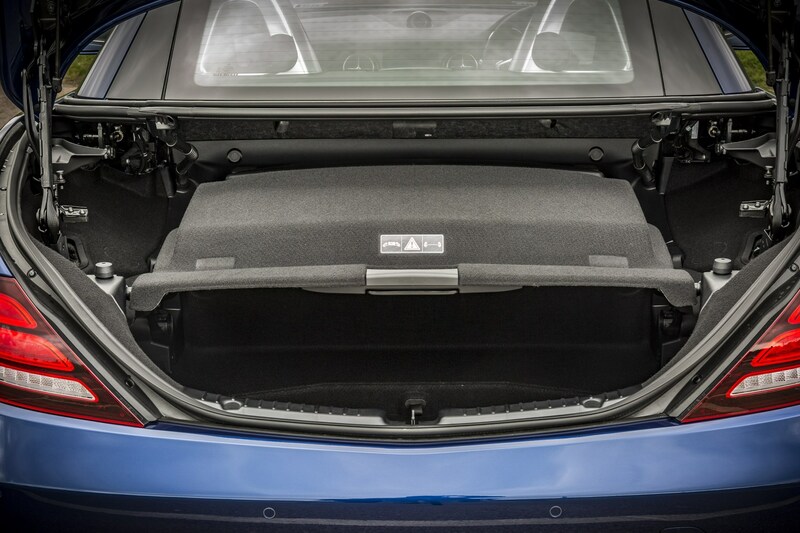 This helps maximise load space by dividing off the area in the boot occupied by the roof when it has been lowered, so you know exactly how much room there is. 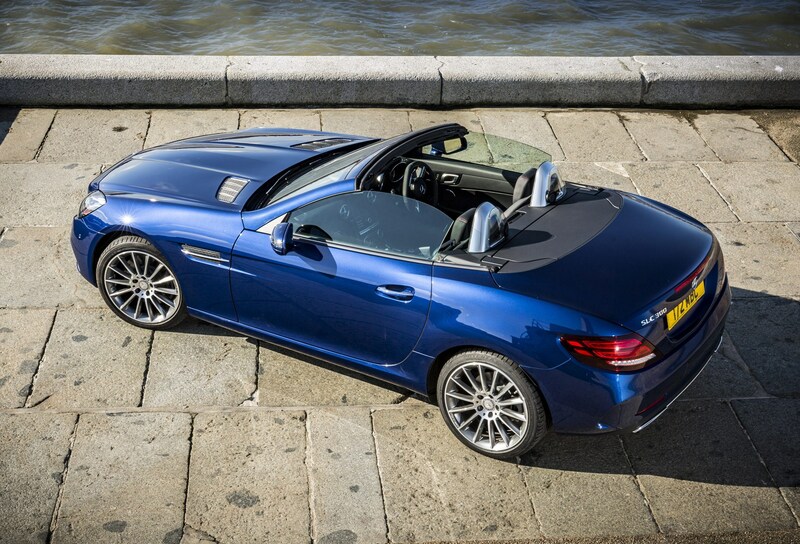 For chilly days with the roof down you’ll want the Airscarf option which blows warm air from a vent in the headrest to help keep you warm. 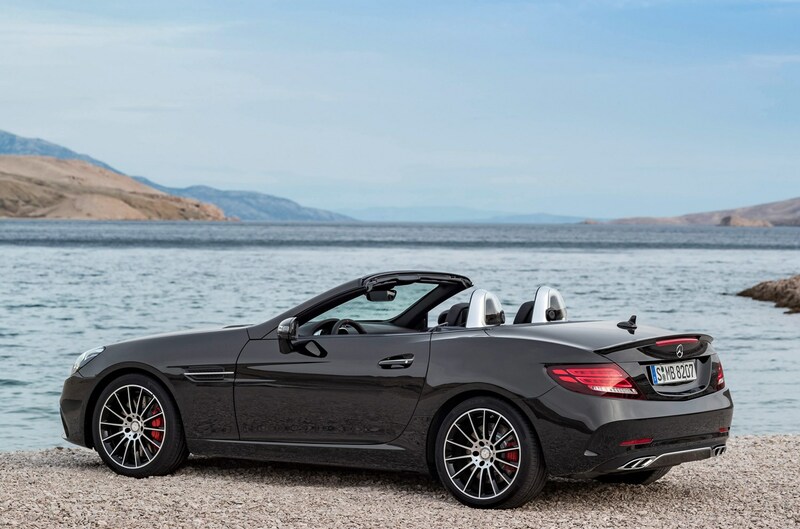 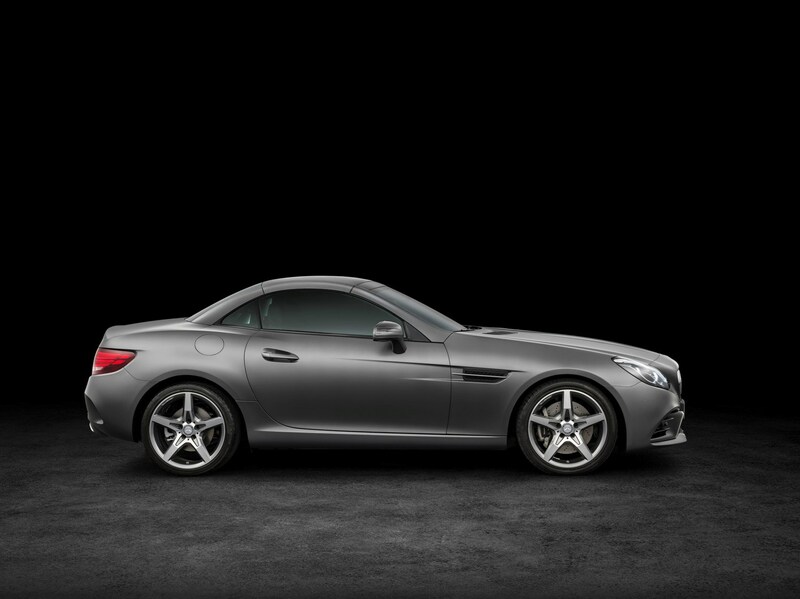 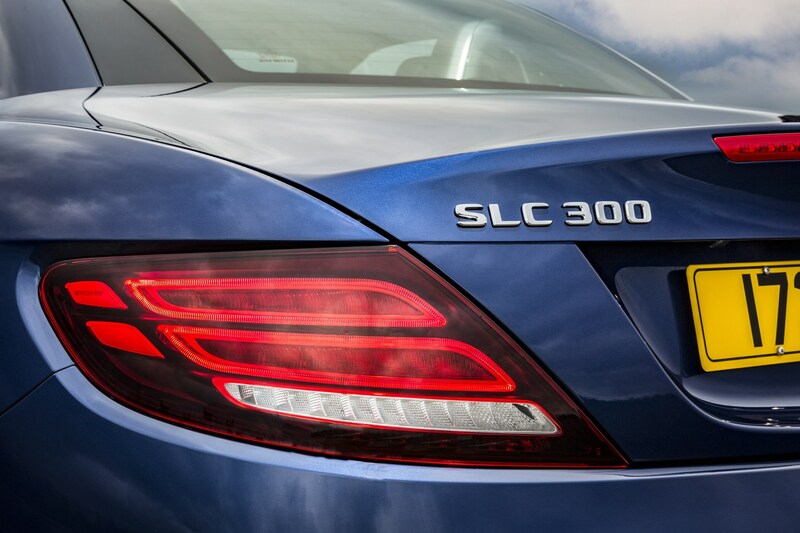 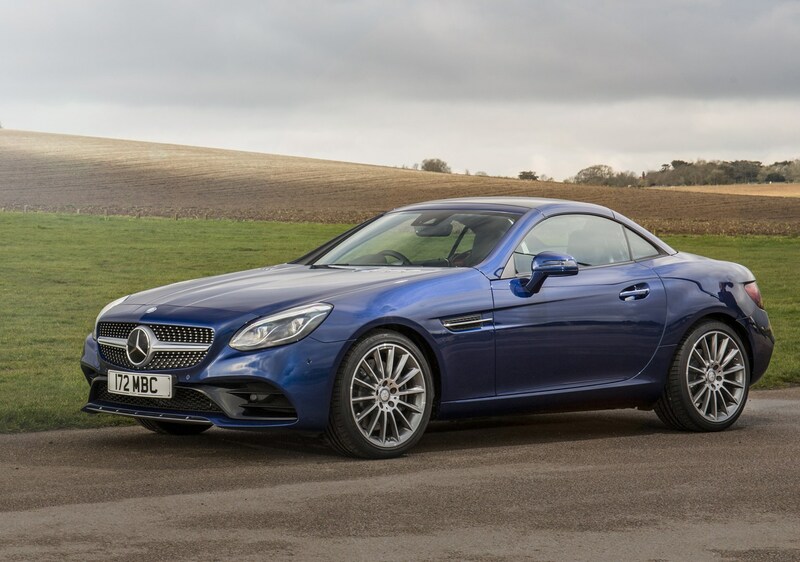 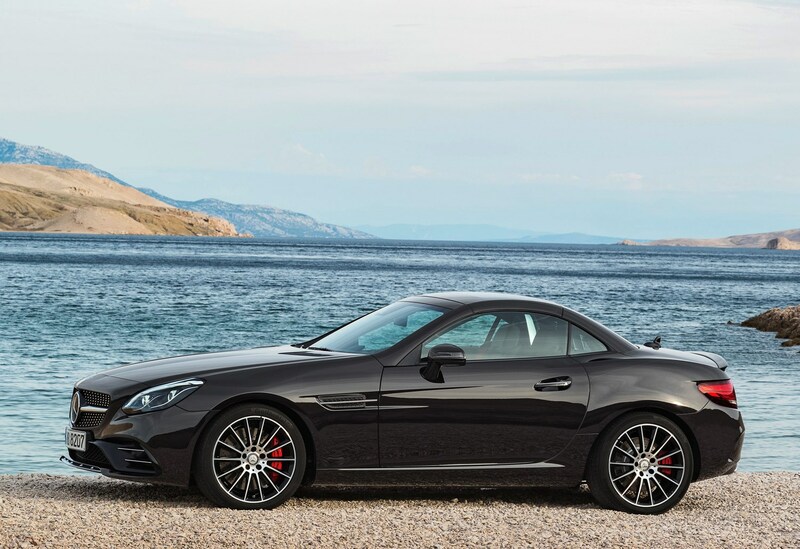 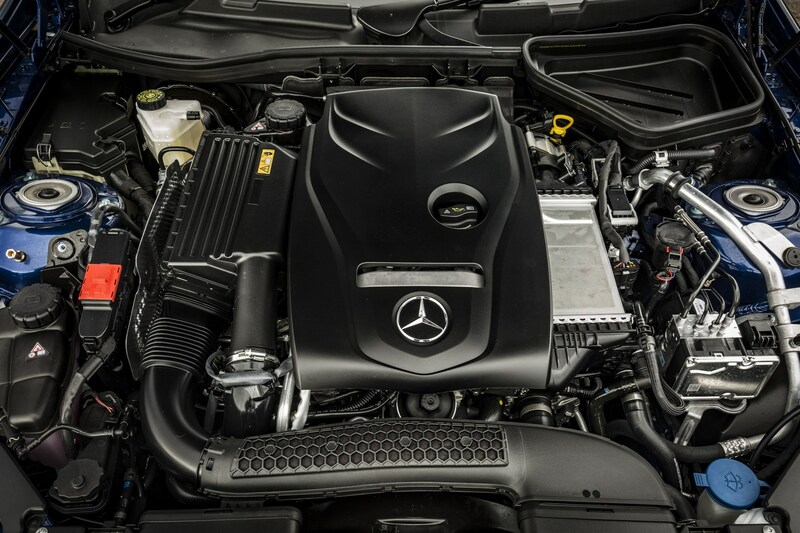 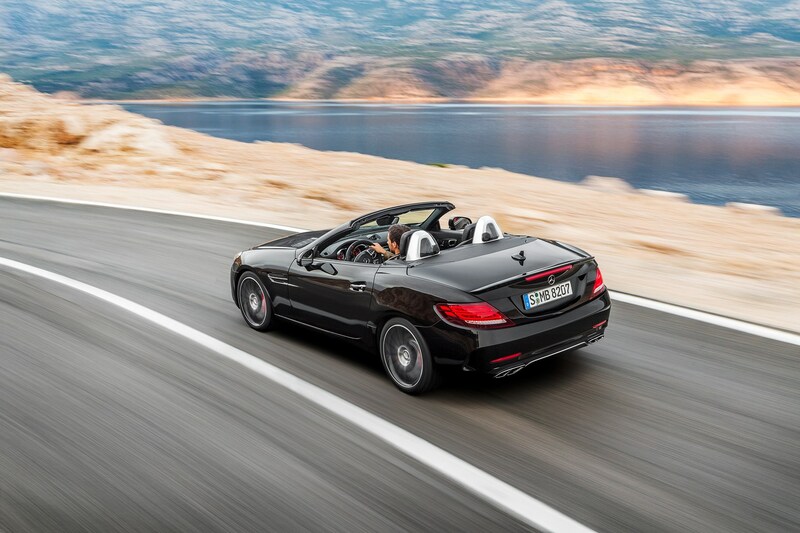 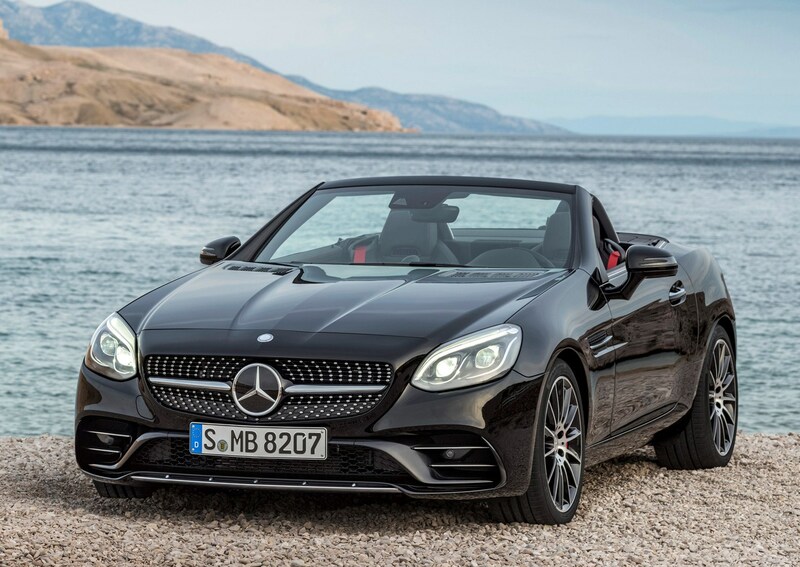 The basic equipment list includes equipment that is standard across all versions of the Mercedes-Benz SLC-Class. 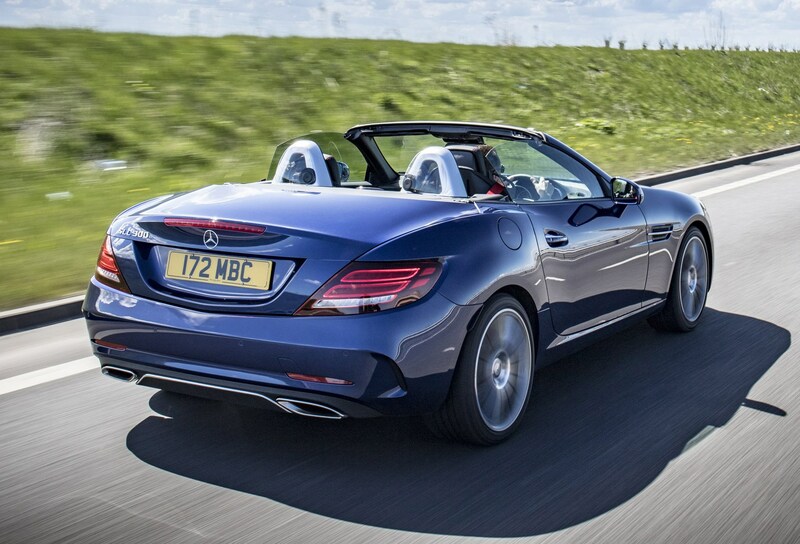 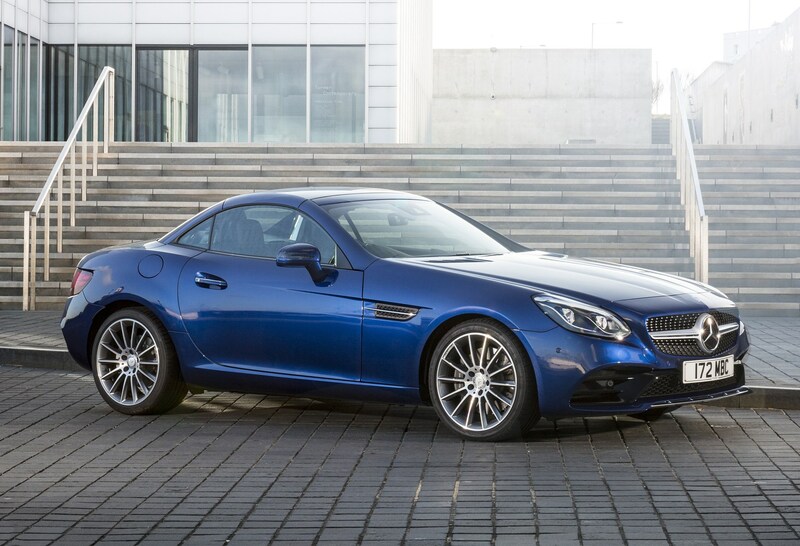 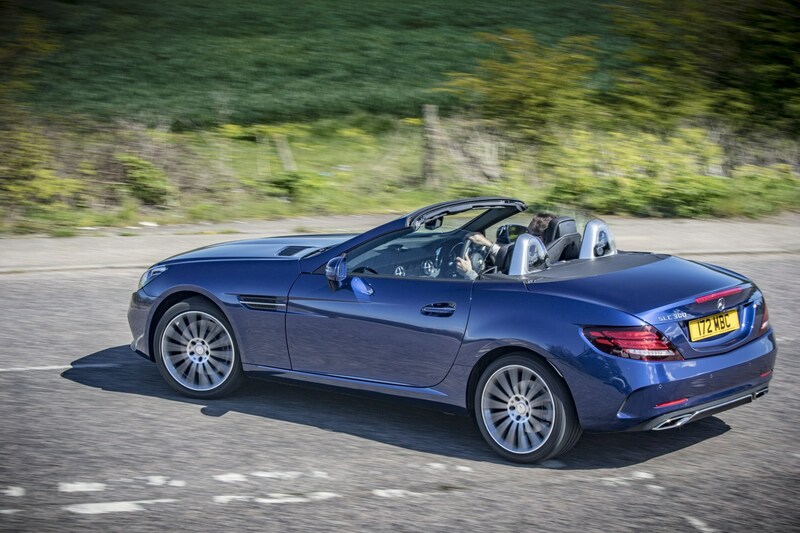 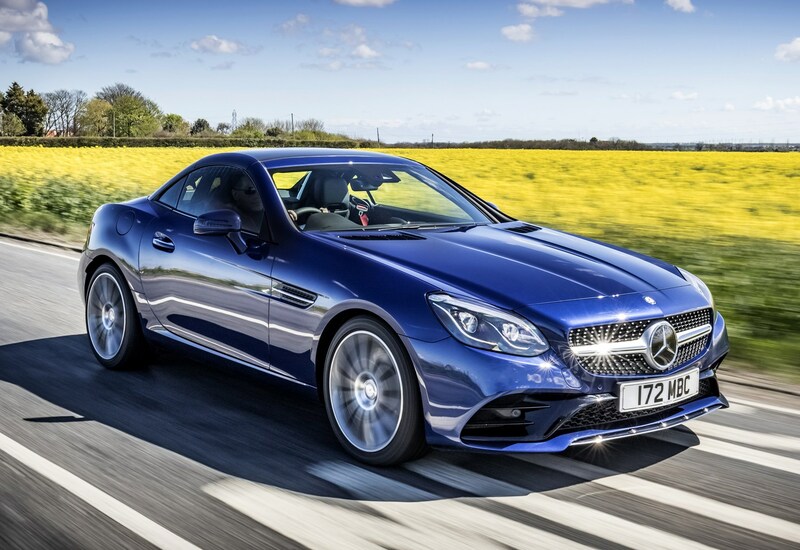 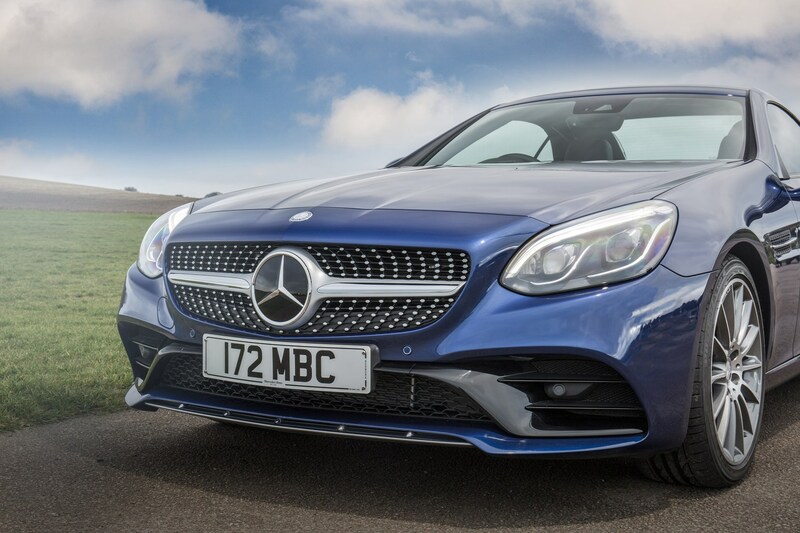 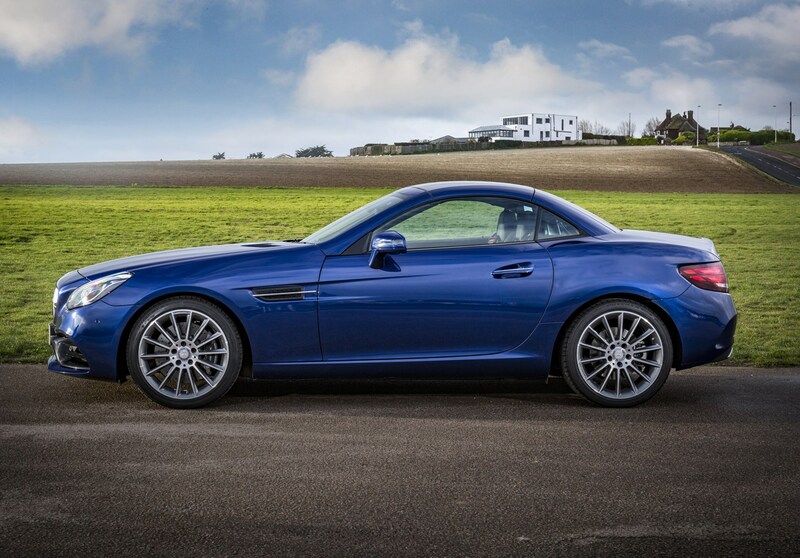 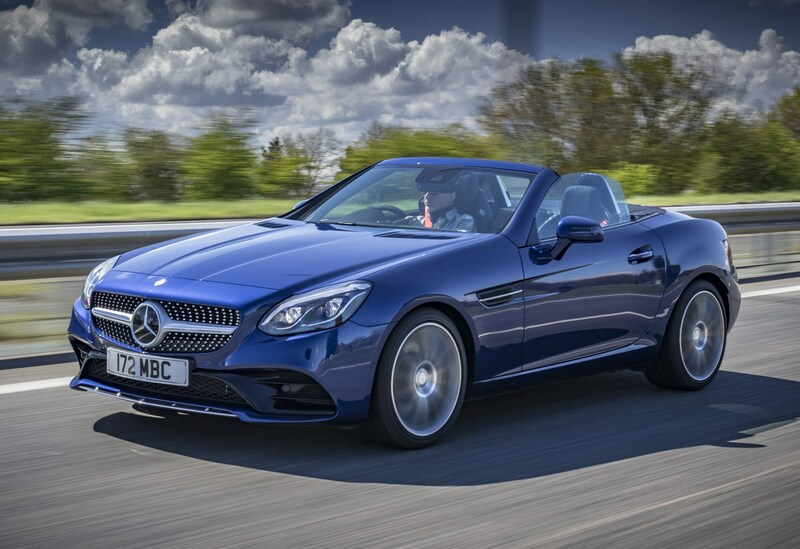 The SLK gained a four-star crash test safety rating from Euro NCAP but the SLC hasn’t been tested yet. 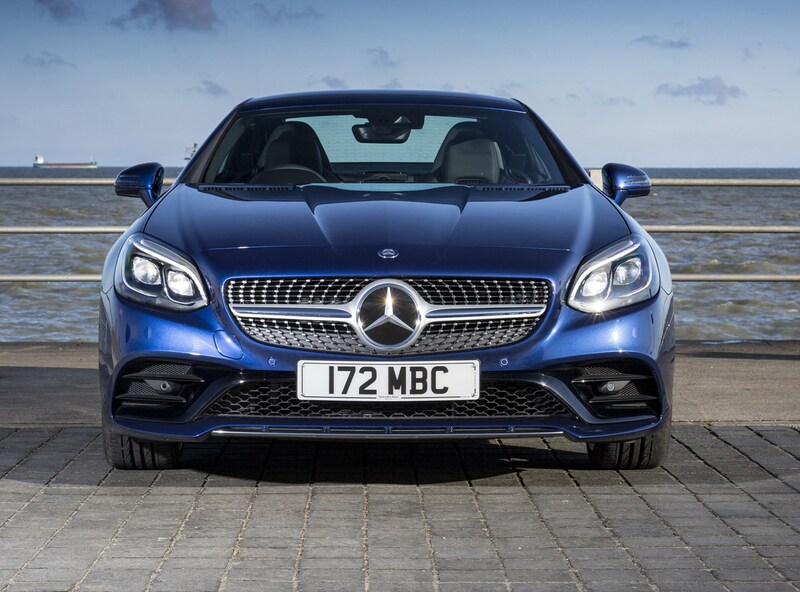 We expect it’ll do well though thanks to advances in safety equipment and driver assistance systems, including the automatic Active Brake Assist, a fatigue detection device and Active Bonnet, which pops up to protect pedestrians in the event of a collision. 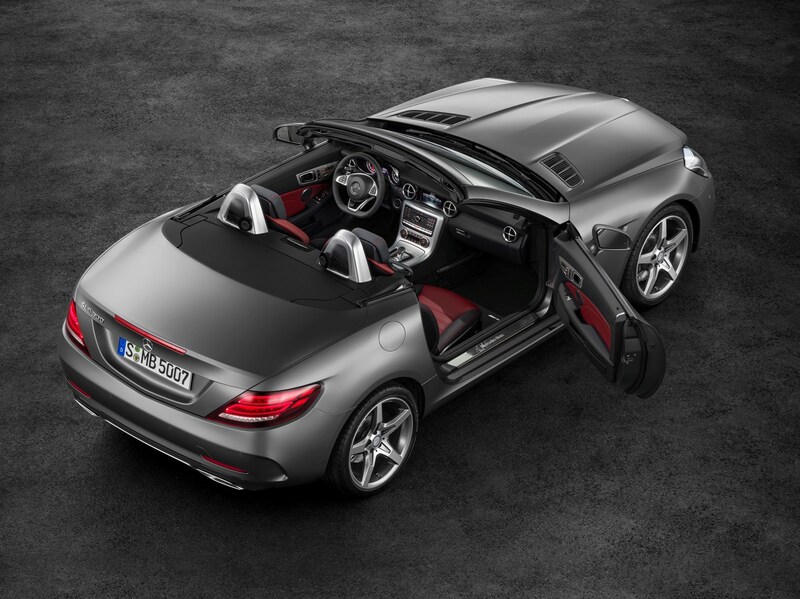 Similar stakes here to the SLK with 335 litres of space in the boot with the roof up, and a boot separator that automatically lowers into place when the roof is down. 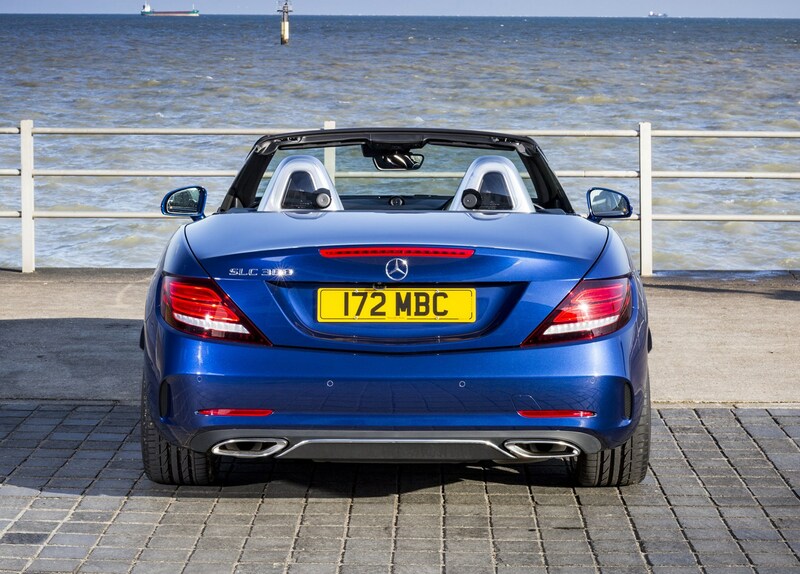 Good enough for a couple of weekend bags. 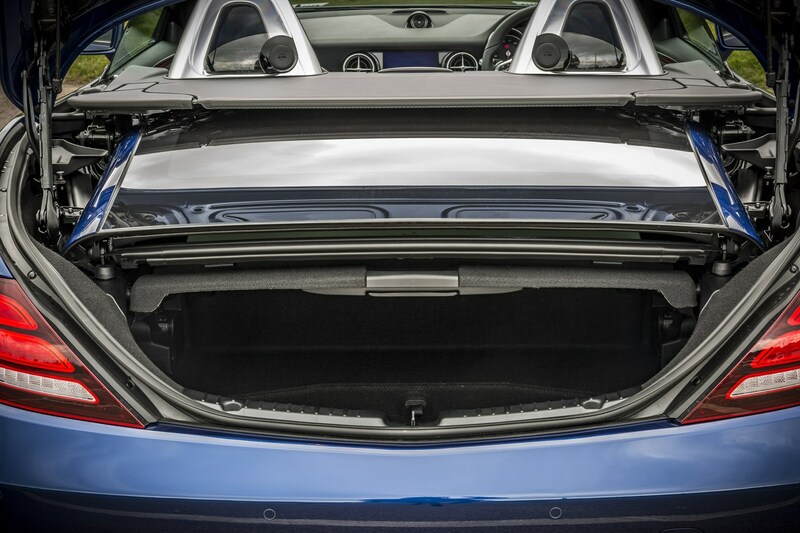 In terms of cabin stowage there are a couple of medium-sized cubbies and a decent glovebox but you’re better off putting things in the boot unless you need them. 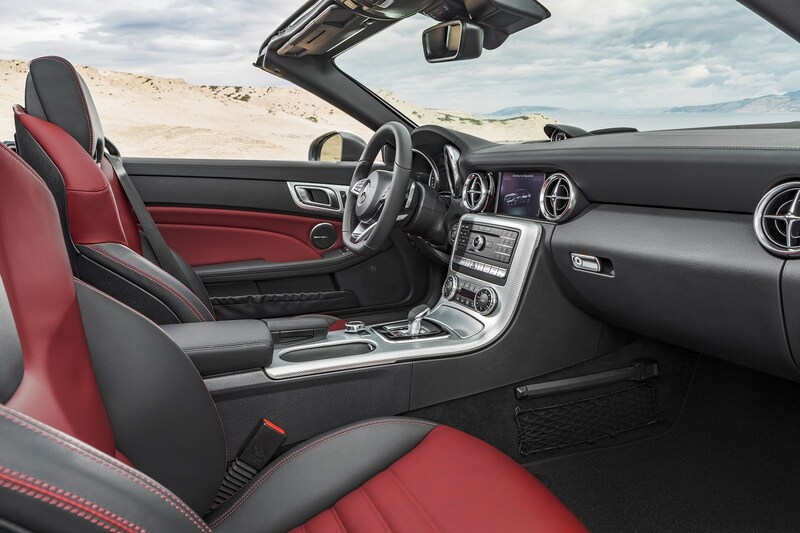 Shorter occupants won’t notice much more than a breeze but if you’re tall then there’s a chance you’ll want to set the seat quite low in order to avoid hair displacement. 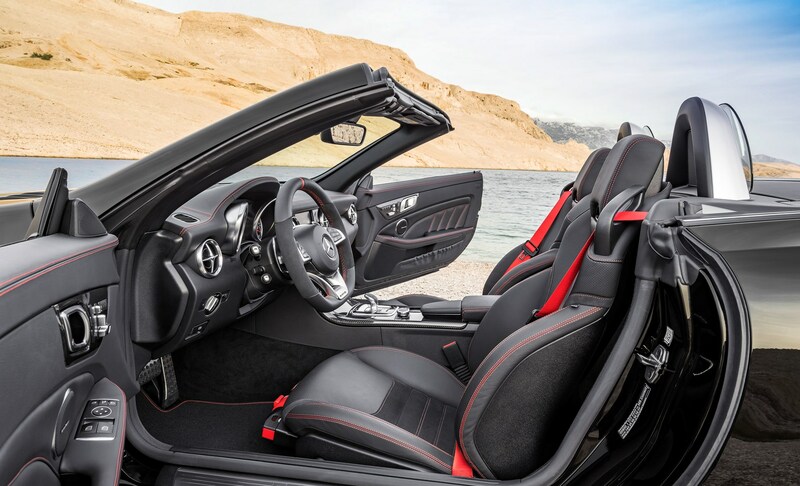 There’s plenty of legroom but be aware that if you set the seat all the way back, you won’t be able to adjust the angle of the backrest. 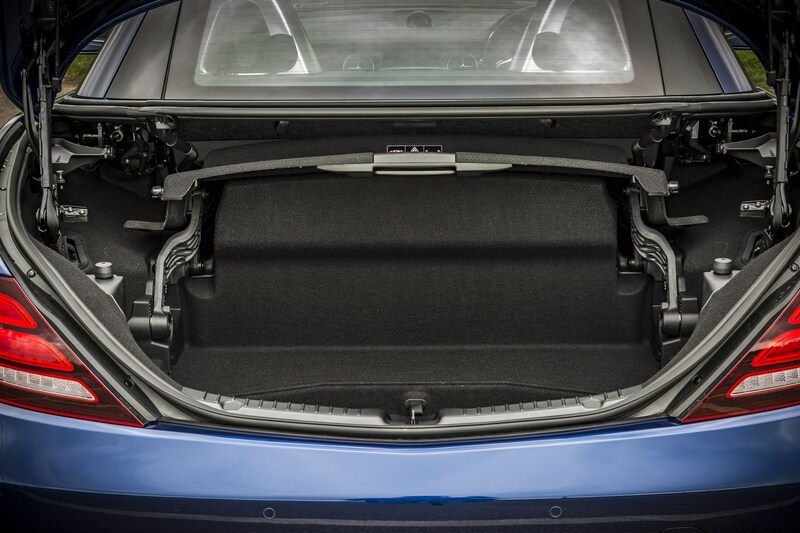 How does the boot space compare? 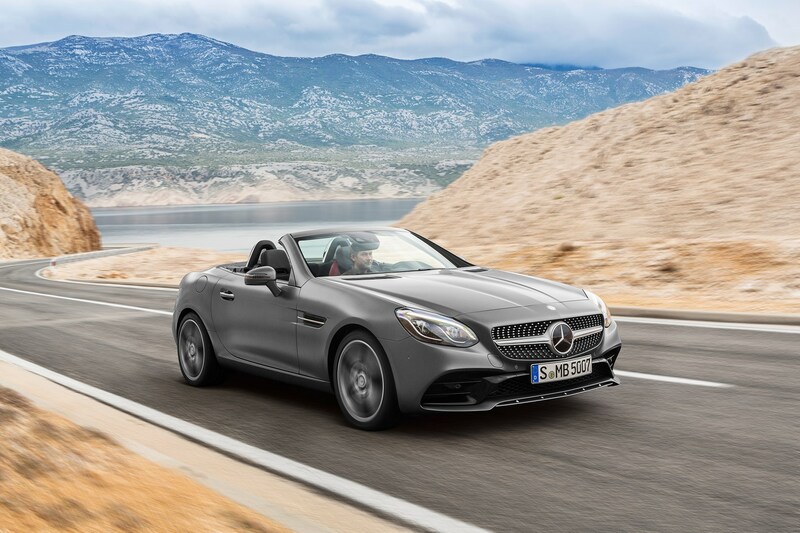 Check the table below to see how the Mercedes-Benz SLC-Class compares to other similar cars in terms of available boot space.